We loved this really unusual jumper from the moment we first saw it. 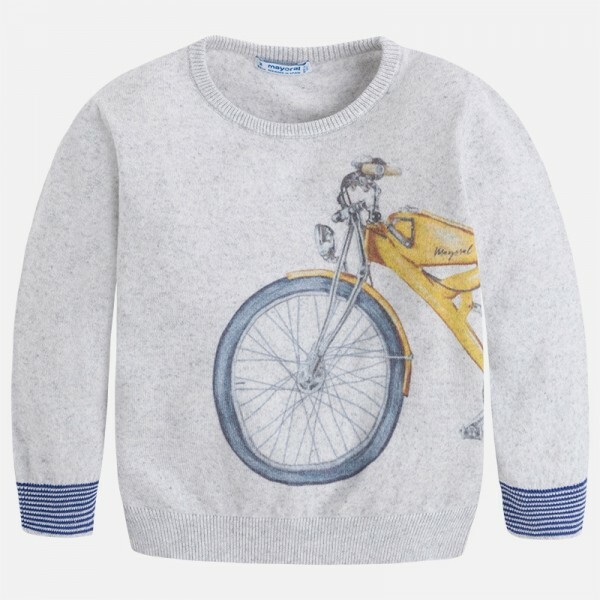 Made in style by Mayoral in soft summer cotton, it has a motorbike motif, with blue striped cuffs. Perfectly designed for the summer, it's a stylish and exceptionally cool piece that your little man will never tire of wearing. It's a great choice for the warm weather - lightweight and easy to wear but warm enough for when hot days get colder in the evening. The motorbike theme is a really unique design feature that makes this piece something completely out of the ordinary. It's a jumper you can easily mix and match - team it with shorts during the day or with smarter chinos for a barbecue.